Bernie Sanders supporters will silently protest the president's trade deal tonight during his speech at the Democratic National Convention. 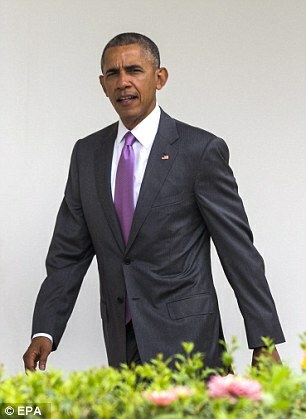 Sanders supporters told DailyMail.com that they would hold up signs indicating their displeasure with the Trans-Pacific Partnership during President Barack Obama's remarks. They also plan to repurpose the inflatables - the letter 'O' for Obama - that are being distributed for use during the president's speech to display anti-TPP messages. 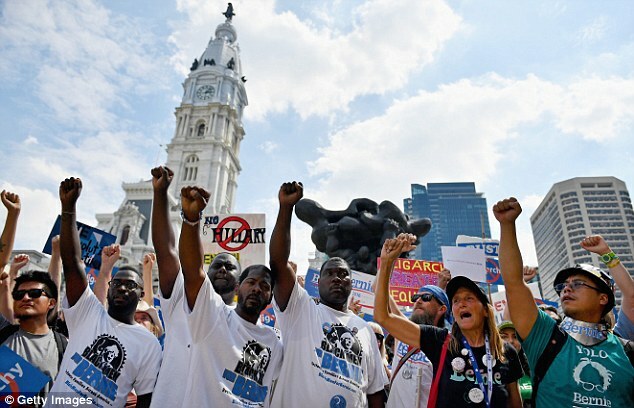 A plan to shout down the president over the trade agreement that Sanders pegged as 'disastrous' was scrapped by three delegations amid concerns the protest would be viewed through a racial prism. 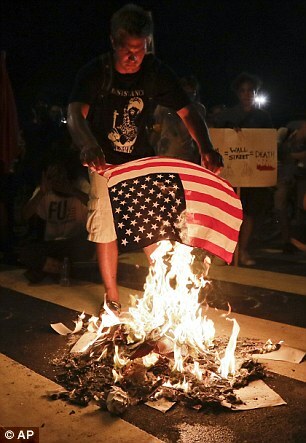 Others said they believed it would be 'disrespectful' to holler at the United States' president. 'Everybody's pretty much aligned on nobody's dissing Obama,' Jill Dunham, a Michigan delegate said. Instead, delegates were considering making an example of Virginia Sen. Tim Kaine, Hillary Clinton's running mate. That's why he said they were leaning toward a silent dissent that involves holding up signs. Lauren Steiner, a delegate who helped organize the Monday protest on the floor of the party platform, said the president is the one acting out of turn. 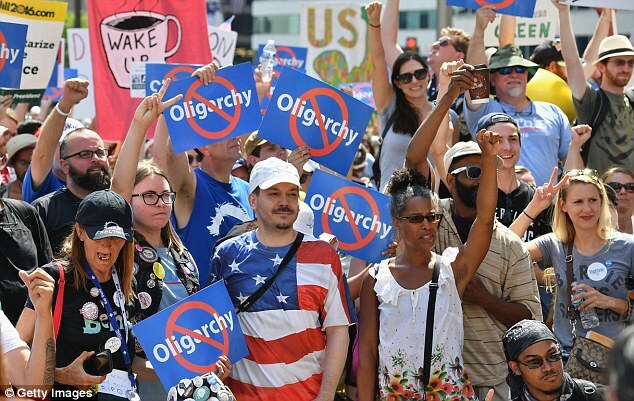 'I think it's disrespectful for the President of the United States to be pushing with the Republican leadership over the objections of the Democratic Party this NAFTA on steroids, which if passed will represent a global corporate coup d'etat. Convention officials acted this afternoon to block dissent, warning delegates that they'd have their credentials yanked and wouldn't be allowed to enter the area on the final night if they were caught displaying unapproved signs, one delegate said. Cassandra Fairbanks of SputnikNews.com posted a video on Twitter of a man presumed to be a DNC official collecting Bernie Sanders paraphernalia. Sanders backers opined to DailyMail.com on Tuesday that the national party left them no option but to protest in refusing to allow them to have their say through a democratic process. Had delegates been allowed to speak out on the floor about the platform, Benchich said they wouldn't have had to air their grievances the way they did. He rejected the notion that delegates had multiple opportunities to provide their feedback on the platform during a series of meetings across the country in June and July. That process was controlled by the DNC, he said, at top-down body - they decided the rules. Monday Sanders delegates attracted negative attention as they campaigned on the floor against the trade accord while African-American Congressman Elijah Cummings shared an emotional personal story about the hardships his father faced in a segregated America. A participant in the protest who was positioned at the front of the stage and was prominently photographed said today she felt the press was mischaracterizing their dissent by bringing up Cummings' race and suggesting the two were connected. Citing the incident, she declined to share her name. Steiner, an organizer of the demonstration, said the optically-challenging incident was the result of failed communication between organizers. They planned every detail down to the hand signals that 'whips' would use as they shouted 'mic check' to summon their delegates. Organizers never agreed upon an end time for the clamor, assuming they'd be stopped at a certain point by party hands. 'And they didn't stop us, so we kind of did it until we got tired,' Steiner said. So the shouting continued through Cummings. 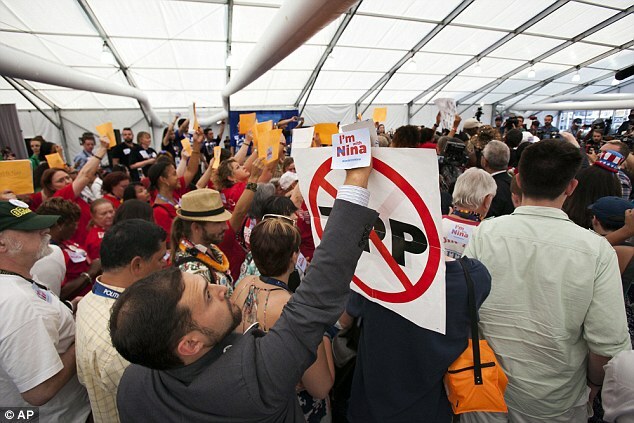 Concerned that a verbal Obama protest would play poorly for the same reason, delegates decided against it and planned to hold up signs during his speech declaring their opposition to his secret trade deal that was negotiated behind closed doors. Even members of Congress were disallowed from taking copies of the paperwork back to their offices to prevent a leak of the language while it was being negotiated. They had to visit a private room whenever they wanted to see it. Republicans in Congress gave the president the authority last year to fast-track the Pacific Rim deal. In doing so, they gave up their right to amend the text - something other nations involved in the creation of the pact had demanded. Congress must still approve the pact, however, in order for it to go into effect. Progressives are demanding it not be brought to the floor for ratification during the so-called lame duck session between November and the January inauguration. 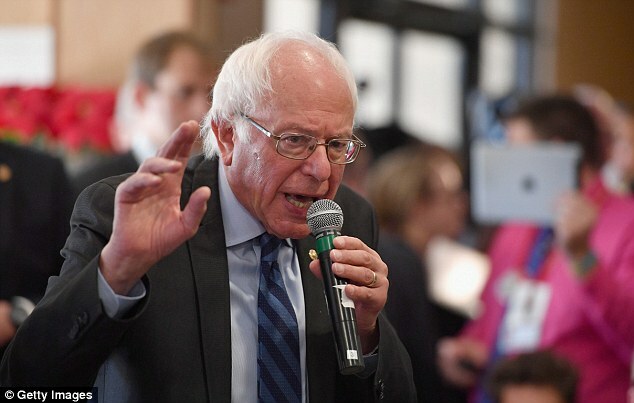 Sanders vehemently campaigned against the trade deal as a presidential candidate and his delegates and surrogates aggressively fought to have a disclaimer added to the Democratic Party platform saying they do not support it. The language they were pursuing was nixed by party officials opposed to publicly contradicting the sitting president even though Democratic nominee Hillary Clinton says she, too, opposes the trade deal. Clinton helped to create the 12-nation deal as secretary of state. Under siege from labor groups, she backed off from it last summer, saying she could not support it in its current form - even though she wasn't supposed to have access to it the time as it was not yet public. The flip-flop became a major point of contention throughout the Democratic primary, as Sanders and Republican Donald Trump hit her from both sides for undercutting American workers. The North America Free Trade Agreement, which they also oppose, was her husband's doing. Clinton ally Terry McAuliffe got her into even more trouble with the left this week when he claimed that as president she'd tweak the the deal but wouldn't scrap it entirely. McAuliffe had to back track after the Democratic nominee's campaign chairman publicly called him out. 'Love Gov. McAuliffe, but he got this one flat wrong. Hillary opposes TPP BEFORE and AFTER the election. Period. Full stop,' Podesta tweeted. Her VP pick Tim Kaine was also for it before he was against it. Kaine was touting the deal up until the point he joined Clinton's ticket. Sanders delegates said Tuesday that they did not trust Clinton and Kaine to keep their word and block the deal if elected. 'Hillary Clinton says she's opposed to the TPP, but everybody knows that she just flipped to that position because Bernie Sanders was against it,' Steiner said. 'But nobody believes her. She added, 'I mean there's a reason she has one of the highest untrustworthy, highest dishonesty rates, because she says one thing to one audience and another thing to another audience. Steiner said she ran into Kaine Tuesday morning and told him point blank that the accord should not come up for a vote during the lame duck. He told her, 'Right, I'm with you' she said and promised her it wouldn't come up for a vote in the lame duck.